The National Museum of Scotland -- the most-visited attraction in the UK outside of London -- has announced the opening date for three new galleries dedicated to East Asia, Ancient Egypt and ceramics. Set for February 8, 2019, the opening of the galleries 100 days from now will mark the completion of a 15-year transformation of the National Museum of Scotland that has involved restoring the Victorian building and displaying more of its holdings. The three new galleries will feature 1,500 objects in all, 40 percent of which will go on show for the first time in a generation or more. Ancient Egypt Rediscovered will cover 3,000 years of history, displaying objects including the only intact royal burial group outside Egypt, the only double coffin ever discovered in Egypt, and a cosmetics box said to be one of the finest surviving examples of decorative woodwork from ancient Egypt. Also in the spotlight will be the various contributions made by Scottish people to the field of Egyptology. Exploring East Asia focuses on the cultures of China, Japan and Korea, featuring the museum's notable East Asia collection, which is among the most important in the UK and represents more than 150 years of continuous collecting. Objects will include a headdress from 18th-century China made of kingfisher feathers, sets of armor and Japanese woodblock prints. In Art of Ceramics, visitors will be able to learn more about the versatile medium with examples from across the world dating from the 11th to the 21st centuries. Among the central themes will be the importance of ceramics in international trade and their use in scientific and technological applications, with examples such as 19th-century false teeth, heat-protective coatings and high-tech brakes used in motorsports. The new galleries add to the more than 13,000 objects that have already been put on display across 26 galleries since the start of the museum's transformation. During that time, the museum has become the most-visited attraction in the UK outside London, welcoming more than 2.3 million visitors annually. Located in Edinburgh, the National Museum of Scotland completes its revamp in the same year as the opening of the brand-new V&A design museum in nearby Dundee. Academics have used X-rays to visualise an Ancient Egyptian mummy that has been part of an Aberdeen university collection for more than 200 years. Ta-Kheru, who was born around 750 BC, is the focus of an exhibition at Aberdeen University's Sir Duncan Rice gallery. Using computed tomography (CT) scans and the latest medical visualisation techniques, researchers have been able to recreate her body from mummified remains – a first for the university. And a facial reconstruction has also revealed what she would have looked like. The CT scans showed that her body was covered in more than 50 layers of linen wrappings treated with embalming resin. She also had a shroud over her face, indicating she was of a high status. As well as being able to see her sarcophagus and coffin, which have been in the university's collections since the 18th Century, there is a hologram and X-ray of what her skeleton looks like. The facial reconstruction used the bones of her skeleton, as well as discussion and research into her ethnicity, influenced by the belief that her grandmother was a Syrian prisoner of war. Other details, such as the fact she was a mother, had teeth missing and signs of bone atrophy have helped to paint a fuller picture of Ta-Kheru's life, and where she lived up until her late 60s or early 70s – almost double the average life expectancy for the time. Neil Curtis, head of museums and special collections at Aberdeen University, said: "There are three bits to the exhibition – the story, seeing the real mummy and the facial reconstruction, where you see her as a real person and the wow of technology, which is quite emotive, as you're seeing her skeleton. "She's been in the university for more than 200 years and it's only in the last year that we've now found out who she was – and that's astonishing. We've found out her family, when she was born and when she died. "It's a focus on one woman's life, and that's something that makes this exhibition different, as there are plenty of exhibitions on Ancient Egypt. "She is one of the earliest mummies to have been found and taken to a museum so that's why she's not in as good condition as her sister, if you look at pictures, as she was excavated archaeology." There is a range of events ongoing as part of the exhibition, which are free but require booking. Ta-Kheru will remain on exhibition until December 11, after which she will travel to Cincinnati as part of a partnership with the Roemer and Pelizaeus Museum of Hildesheim, and will begin a tour of the US from February. The partnership with the Hildesheim museum has allowed the reconstruction work to be undertaken, with the face created by Museums Partner. Neil added: "We've got the collection, but we don't have the expertise in Aberdeen. No one does Egyptology. We're getting to see the premiere. 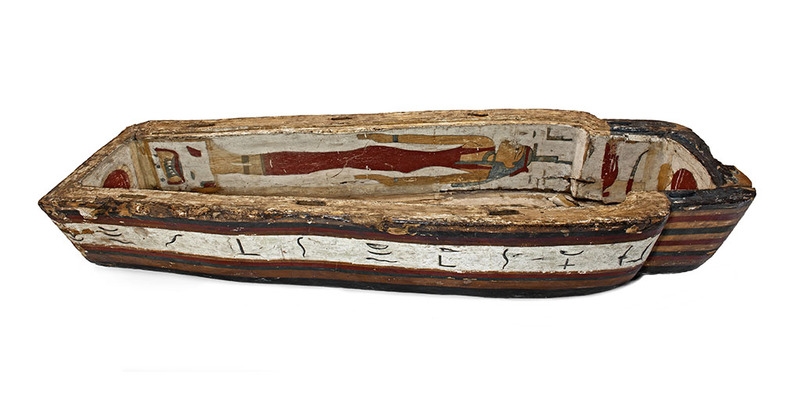 "The lid of her coffin is currently in Victoria, in British Columbia, on loan." Egyptology and mummies have fascinated Scots, young and old, for decades. Whether they're interested in the archaeological factors that led to their discovery, or just have a passing interest through the scares of horror films, they have always held a fascination. The University of Aberdeen Museums and Special Collections are currently holding a special display at the Sir Duncan Rice Library. Using CT scans and the latest medical visualisation techniques experts have been able to uncover insights into the life of Ta-Kheru, an ancient wealthy Egyptian woman whose ceremonially mummified remains have been in the University of Aberdeen museums' collections since the 18th century. The exhibition tells the story of Ta-Kheru, who lived in the 300s BC, alongside an impressive holographic display of the CT scan and a facial reconstruction of The Lady of the House. How Ta-Kheru came to be in Aberdeen is a fascinating story in itself. She was given to Marischal College by Charles Forbes of Newe in Aberdeenshire in 1821. Forbes (1773-1849) was sent to India to join the family firm of Forbes and Company. That company had been founded by his uncle, John Forbes, in 1767, initially as a cotton trading company, but then widening its interests to include ship brokerage, ship building and then banking. Forbes and Company Ltd. is now the oldest company in India, part of the Shapoorji Pallonji Group, specialising in engineering, business automation, shipping and logistics. Museum archives record that Forbes transported the mummy of Ta-Cheru and her coffins from Coseir (Al Qusayr) in Egypt to Bombay (Mumbai), presumably during his voyage to India around 1790. After returning from India in 1811 he had become a prominent Member of Parliament, often speaking on Indian issues, head of Forbes and Company on the death of his uncle in 1821, and was made a baronet in 1823. He was also elected as Rector of Aberdeen's Marischal College, a largely ceremonial role, eight times between 1814 and 1833. The exhibition will run until 11 December, with opening times 10am-5pm Monday-Wednesday, 10am-7pm Thursdays, 10am-5pm on Fridays and 11am-4pm Saturdays. Admission is free, with no booking required. Archaeologists have long wondered exactly how the ancient Egyptians constructed the world's biggest pyramid, the Great Pyramid. Now, they may have discovered the system used to haul massive stone blocks into place some 4,500 years ago. We need to take a stand on the condition of Egyptian antiquities abroad. I traveled to London in October, to participate in the American University of Cairo's fundraising campaign to help students who were financially-disadvantaged, yet gifted. I decided to take a taxi to Times Square, to see the Egyptian obelisk there. I tried hard to see the obelisk, but found it surrounded by trees, barely visible, and in very poor condition. The reason for this visit was that I had known the obelisk was in London for about 200 years, and assumed the English would have celebrated its existence in the city. A journalist from the Economist asked me: Why did the mayor of the city not celebrate this gift from the Egyptians to the English people? This led me to respond, "If you do not appreciate the value of the obelisk, I hope it returns to Egypt." 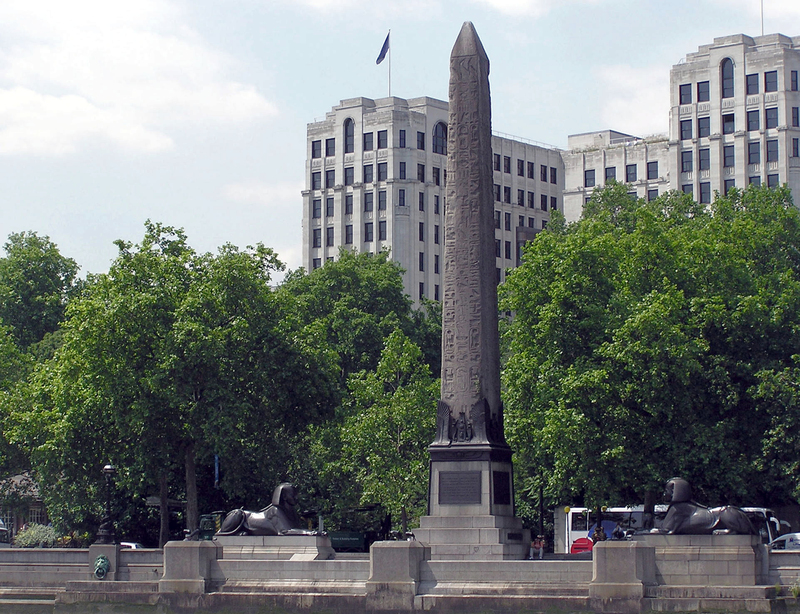 The obelisk's history in London dates back to Mohamad Ali Pasha, who decided to gift the monument to England in 1819, after Lord Nelson and Commander Cromer helped him with battles on the Nile and Alexandria, respectively. The obelisk was found inside Heliopolis's Temple of Ra (the ancient Egyptian deity of the Sun) built by King Thutmose III – Egypt's greatest king warrior, nicknamed the Napoleon of Ancient Egypt. The majority of Ancient Egypt's kings also established temples and obelisks within Heliopolis. From that city came the first interpretations of the creation of the universe, the first solar calendar, and even the first university in history: the University of "On", which carries Heliopolis's old name, before it adopted its Greek name, meaning "Sun City". The University of On is where Prophet Joseph received his education, before marrying the daughter of On's minister, and having children with her. Aristotle and Plato received education at the same university. This obelisk was transferred in ancient times, from its home city to Alexandria. It was placed inside Serapeum, and has since been known as Cleopatra's Needle. Despite Mohamad Ali Pasha's later offer to gift the monument, the English found it difficult to fund the obelisk's transferal to London. It was only sent through in 1878. The obelisk is made from red granite, rises about 21 meters, and weighs 224 tons. It is the same length of the obelisk in New York, which weighs 200 tons, dates back to the reign of Thutmose III and is engraved by Ramses II. I have asked the Mayor of New York either restore this obelisk, or return it to Egypt. A general announcement was made to restore the obelisk. Citizens participated in New York, and raised funding, and the obelisk was restored. In addition, slums were removed from around it, and when a powerful storm came, it removed the trees from around the obelisk, giving the monument visibility from all sides. This is what we are demanding from the Mayor of London. I will will submit a request to Antiquities Minister Khaled el-Anany – as he heads the National Committee for the Restoration of Stolen Antiquities – to send a letter to the mayor of London, asking him to take care of the obelisk, restore it, and remove the trees from its vicinity so it becomes visible in the square. London's obelisk was already restored once, following its damage from the Second World War. I believe that care for our antiquities shouldn't be kept within our country; we should preserve our antiquities abroad, because they are not only the property of their recipients. We must have the right to preserve them, or return them to Egypt if neglected. Finally, I add that the case of Egyptian monuments showcased in museums abroad should be reviewed, as there are many museums that display our antiquities without secure or good showcasing. This is a subject that should be discussed and presented to Egyptian intellectuals. CAIRO – 30 October 2018: Sotheby's International Auction House in London presented an auction titled "The Arts of the Islamic World in the Middle East". The auction included four Egyptian manuscripts for sale. Only one Egyptian manuscript was sold, which is a great binding for Morocco, Egypt and Syria, that goes back to the 15th century, dating back to the Mamluks era. The piece was valued at £10,000. It is noteworthy that the three remaining Egyptian manuscripts were not held for sale in the auction, and included one which dates back to the Mamluks era during the 14th and early 15th centuries. The piece was labeled "Al-Samad Astrological Images" and was valued at an estimate cost of £6,000 to 8,000. Moreover, the third manuscript is a text from the Holy Quran, dating back to the second half of the 14th century, and is estimated to cost between £6,000 and 8,000. 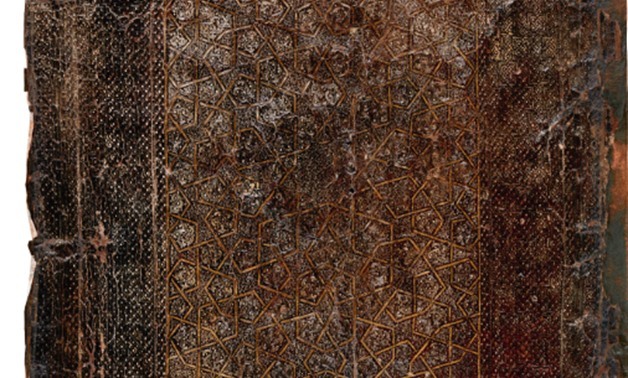 The fourth manuscript is part of the 14th century Quran scripts, estimated at a value of £8,000 to 12,000. Sotheby's has been uniting collectors with world-class works of art since 1744. Sotheby's became the first international auction house when it expanded from London to New York (1955), the first to conduct sales in Hong Kong (1973), India (1992) and France (2001), and the first international fine art auction house in China (2012). Today, Sotheby's presents auctions in ten different salesrooms, including New York, London, Hong Kong and Paris, and Sotheby's Bid Now programme allows visitors to view all auctions live online and place bids from anywhere in the world. In February 2015, RM Auctions formed a strategic partnership with Sotheby's to become RM Sotheby's , the world's largest auction house for investment-quality automobiles. Sotheby's has a global network of 80 offices in 40 countries and is the oldest company listed on the New York Stock Exchange (BID). The walls and archways of Manial Palace were inspired by Persian, Syrian, Moroccan, Andalusian motifs and European rococo. The prince, an avid traveler and collector, adorned the rooms with furniture and objets d'art that included carpets from all over the Middle East, tiles from Kutahya, in western Turkey, and swords from Jerusalem. The construction of the main building and a "garden of a thousand delights" lasted 30 years, from 1899 to 1929. "The Manial Palace is not an ordinary museum," Prince Abbas Hilmi told Al-Monitor. "It has a unique collection … that includes ancient carpets, medieval manuscripts, textiles as well as weapons, such as swords." Beginning Nov. 1, the association will host "Reviving Heritage through Music," a nine-day international classical music festival bringing together Egyptian and European musicians. Funded by the European Union, the proceeds raised from the event will go toward renovating the 15-room palace. "[The funds will be used] to buy lighting systems and other items that will enable a better display of the collection," Abbas Hilmi said. The Manial Palace opened to the public on March 1, 2015, after a decade of renovations. The restoration project involved work on the palace's main building, gardens, Moroccan-style mosque and clock tower. It has been the site of various concerts and cultural events, mainly focusing on cultural heritage and national identity. From Oct. 28 to Nov. 27, the Manial Palace will host "Nothing Vanishes, Everything Transforms," a pop-up exhibition of works by a number of contemporary artists. Curated by the Art D'Egypte, the exhibition aims at delving deep into Egypt's artistic heritage. The upcoming music festival, Abbas Hilmi said, coincides with two occasions important to his family's reign and the dynasty itself. The first is the 149th anniversary of the Khedivial Opera House, inaugurated by Tewfik's father on Nov. 1, 1869. The second is the 143rd anniversary of Tewfik's birthday on Nov. 9, which falls on the festival's closing ceremony. Cats are amazing creatures; they are nimble and agile, have excellent night vision and acute hearing abilities. They are sneaky, clever predators and their long tails help them to maintain good balance. Cats are so interesting that people love to study their curious behaviour and abilities, and not to mention, watch lots of cat videos! Cats can hear four times farther than humans, and see six times as well as us, too! They can even use their whiskers to navigate, and to measure openings! Cats are one of the most popular pets around. There are about 600 million domestic cats around the world. Just like dogs that have also been domesticated, cats have a special bond with humans, and this has been so for a very, very long time. For as far back as we can possibly tell, through historical records, art, and archaeology, it looks like wild felines started to become our companions since people first started to farm, and they were treated like royalty. That makes sense, because farming and storing grains and other food attract pests such as rats. Rats eat the food that we need to survive, and felines hunt them. Being a good predator to our pests is likely what earned felines the affection of humans. For a long time, it was widely believed that the Ancient Egyptians were the first to domesticate cats some 4,000 years ago. However, there are now clues indicating that felines became domesticated in different parts of the world even before that. The oldest example of a feline skeleton that was very likely a domesticated cat is from around 9,500 years ago in the Mediterranean, which is around the time people started to farm in that region. It was buried alongside a human, surrounded by carved seashells. Different types of cats are depicted in Ancient Egyptian art, in sculpture, statues and paintings. Early Egyptians worshipped different animals for different reasons for thousands of years, but cats seem to have been the most special, regarded as magical creatures. Some different animals were seen as incarnations of gods, and the cat specifically was seen as the incarnation of Bastet, a goddess of joy and protection, and the daughter of the sun god Ra. Killing a cat – even by accident – was punishable by death. Rich families would even dress cats with precious jewels. When a cat died, the owner would shave off their eyebrows as a sign of mourning. Cats were even mummified in ancient Egypt. This is very special, because mummification – which they believed prepared people for the afterlife – was a very lengthy, elaborate, and expensive process. It was mostly only done for Pharaohs (which were similar to kings) and very rich people. Some other animals were also mummified for religious reasons, including birds, bulls, crocodiles and baboons. Millions of mummified animals are known to exist, buried at the temples that honour the gods that they represented. 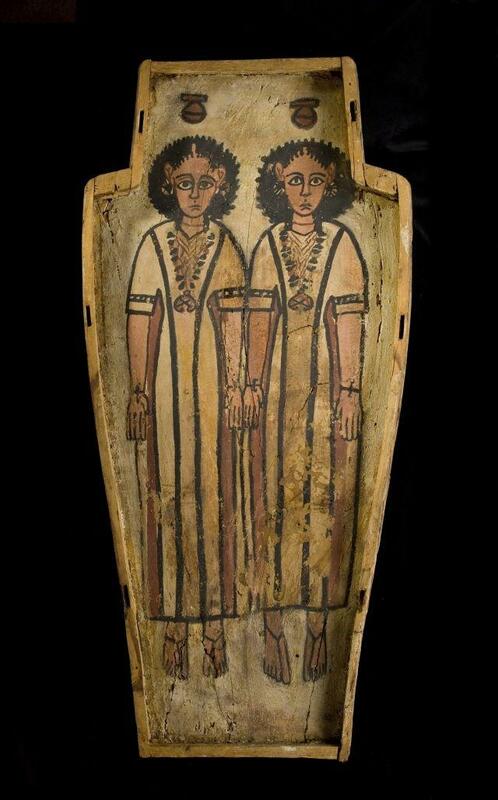 CAIRO – 30 October 2018: Egypt's Tourism and Antiquities Police in Saqqara area, an archeological site south east of Giza, managed to arrestfourpersons while attempting to sell an ancient coffin. The arrest comes as part of Egypt's continuous efforts to combat antiquities' trade, which is prohibited in the African country. 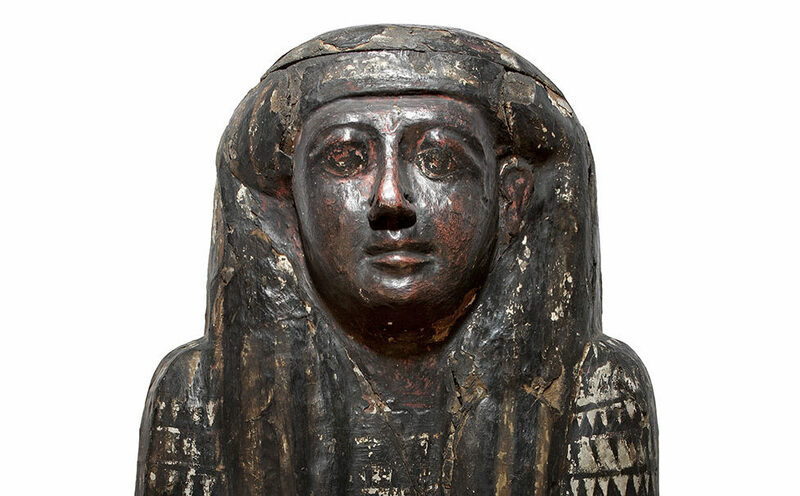 Describing the coffin, the Antiquities Ministry's official said that it is a human-shaped wooden coffin, with a layer of colored gypsum topped by a human face of a woman with a wig. 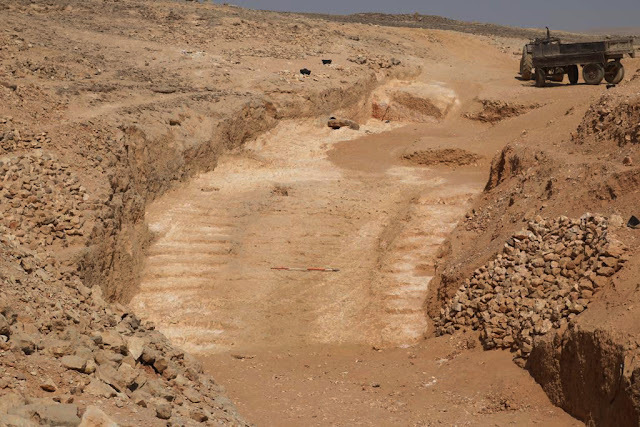 Dr. Yannis Gourdon said "The mission successfully discovered a unique system to pull and transfer the stone blocks from the bottom of the quarry after removing the debris used to cover it which can be dated to the reign of King Khufu of the 4th Dynasty. The moving system consists of the central ramp surrounded by two set of stairs contain poles holes which help lifting the alabaster stone block through at least 20% coarse ramp. There are at least 100 inscriptions discovered commemorating pharaonic expeditions to the alabaster quarries at Hatnub from the Old Kingdom to the New Kingdom. Dr. Roland Enmarch said "The restoration team is working on the preservation of the inscriptions as well as the epigraphic survey of the residential structures around the quarries made of different stone blocks used for the quarries workers. The team unearthed 4 stone steles. One of the steles shows a drawing of a standing person and the other three have unclear hieratic inscriptions due to the bad state of preservation and in need of restoration and preservation. For this month's "From the Archives," we present some rather macabre photographs. Again, we see people flirting with the dead, this time literally. Here we see several familiar names, though perhaps not as familiar faces, posing for the camera. We see Easton Kelsey, son of Francis Kelsey, posing with a skull. We see Leslie Askren, daughter of Dr. David Askren, a colleague of Kelsey's who was a great resource and ally while working in Egypt. Finally, we see Mr. Brunton posing in a mummy case. Mr. Brunton is Guy Brunton, student of William Flinders Petrie, colleague of Joseph Starkey (the original dig director of Karanis), and archaeologist from the British School of Archaeology in Egypt. Mr. Brunton worked at Lahun, Egypt, and it appears some of the Michigan crew had a chance to visit for at least this one day, 26 February 1920 (the Karanis excavations did not commence until 1924). Though a fascination with the dead may still be ongoing, there are a number of differences between people working at excavations in the 1920s and our current excavators working in the field today. Though the skulls seen here may be unnamed people, they are still people. We cannot judge the people of the 1920s using today's standards, but we can make a concerted effort to pay better respect to the people we encounter during excavations. Nameless to us, but these people had names, had families. It is on us to pay them proper respect, not to treat them as props for a photo op. Every few months, the Nile Scribes bring you summaries of the latest news and discoveries in Egyptology, both from the field and the lab. We'll introduce you to the newest archaeological finds or recently undusted manuscripts rediscovered in museum collections, plus other new theories stirring in the Egyptological Zeitgeist. This fall has seen a wealth of new discoveries and research, with much excitement generated by an intact tomb of an Old Kingdom official, a stela with large figures of two Egyptian queens, and a Middle Kingdom cemetery with more than 800 tombs. Did you read our last edition of Discoveries from July and August? 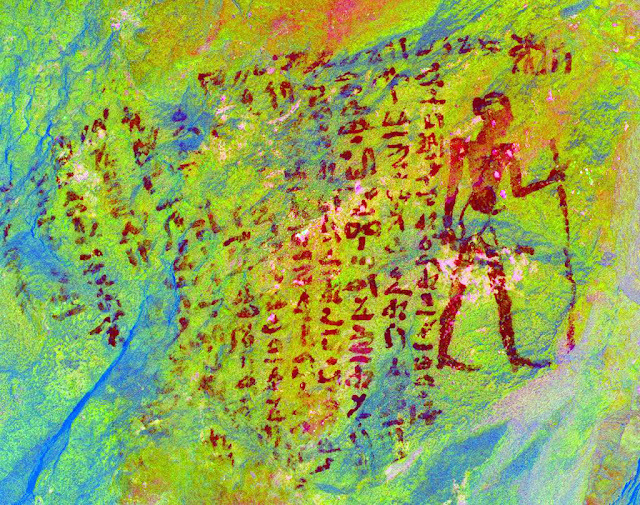 The Egyptian Ministry of Antiquities publishes a very helpful round-up of recent discoveries, events, and projects in Egypt in an accessible PDF format. The latest issue was published in September 2018 (English or Arabic). Nile Scribes: Recent excavations by a French-Egyptian team have added considerably to our understanding of settlement archaeology in the Nile Delta during Predynastic times. Tell el-Samara, located in the eastern Delta, displays evidence of several buildings positioned together with silos and a large quantity of animal bones – signs of increased permanent settlements here. 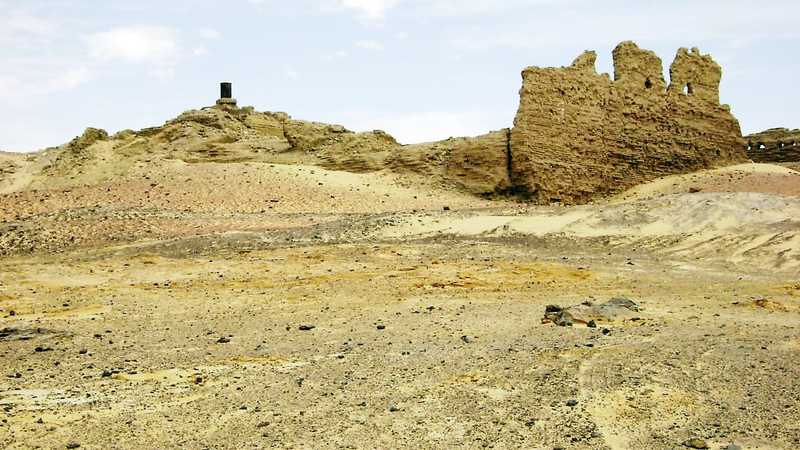 "An Egyptian-French mission has discovered one of the oldest villages ever located in the Nile Delta. 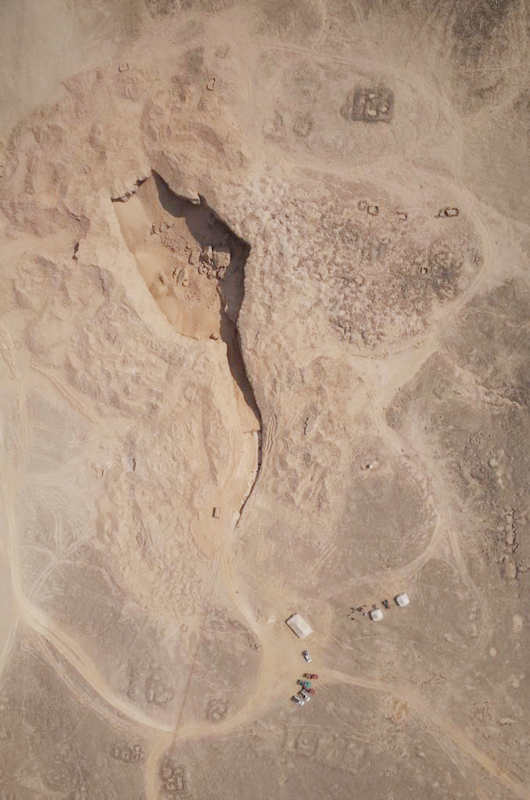 'Discoveries from the Neolithic period are substantially anonymous in this area, so this discovery is of great importance,' announced Frederic Geyau, the mission head. 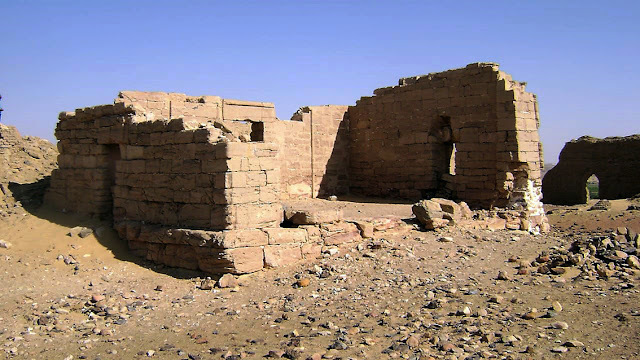 Ayman Ashmawi, the head of the Ancient Egyptian Antiquities sector, recounted that the importance of this discovery is based on the fact that these buildings, which date back to the Neolithic period, are not known in this region, and were only discovered by the Egyptian Exploration Society in one location, namely Sais in Gharbia Governorate." NS: Two pyramids belonging to Amenhemat I and Senwosret I make up the well-known Twelfth Dynasty remains from the Fayoum site of el-Lisht. A mission at the site has come across a cemetery on the north-eastern side of Senwosret I's pyramid. The site was in the news again some weeks later with the announcement that more than 800 tombs were eventually mapped. "A stone cemetery was found roughly 300 meters northeast of the pyramid of King Senusert I, the Egyptian Antiquities Ministry announced on Wednesday. It was discovered by an Egyptian archaeological excavation mission working in the Lisht, the site of the Middle Kingdom's royal and elite burials. Adel Okasha, director of the Central Department of Antiquities of Cairo and Giza, reported that the cemetery is carved on the rocky edge of a mountain, and consists of two areas. The first is an open yard, leading to a vaulted corridor with some hieroglyphic inscriptions, and a cross-sectional hall. On its western side is a small compartment, decorated with traces of inscriptions." NS: Excavations at Kom Ombo continue to unearth new finds. This time, an archaeological team was conducting restoration work on the south-eastern side of the temple. In the process of reducing the groundwater, they unearthed a a human-headed sphinx which may date to Ptolemaic times. "An Egyptian archaeological team has uncovered a sphinx statue while reducing the groundwater level in Kom Ombo temple on Sunday. The discovered statue most likely dates to the Ptolemaic period of Egypt's history; the suggestion of its dating is based on the location of the statue's discovery as it was found in the south-eastern side of the temple where two sandstone reliefs of Ptolemy V were unearthed two months ago." 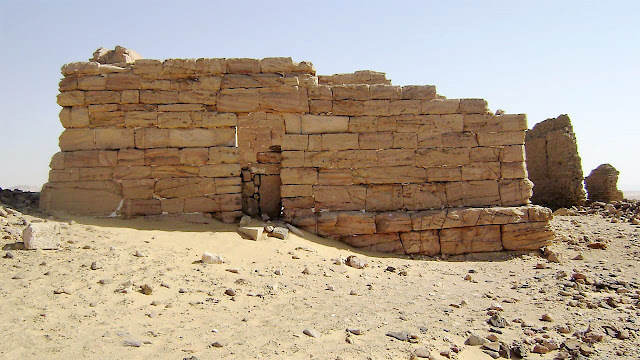 NS: Working on the West Bank at Aswan near the Aga Khan Mausoleum, an Egyptian team uncovered a new tomb containing a sarcophagus with a mummy among other finds. Due to a trove of mummies in the area, it has been suggested that the site may have been a communal burial site. "Sculpted sandstone Sarcophagus dating back to Ancient Egypt's Late period was unearthed near Aswan's Aga Khan Mausoleum during excavations run by an Egyptian archeological mission. The tomb contained a well-preserved mummy wrapped in linen among other things. Tombs with wall decorations portraying Ancient Egyptian Deities Isis, Hathor and Anubis were also discovered along with a group of sarcophagi made of stone and the remnants of a wooden coffin adorned with hieroglyphics. 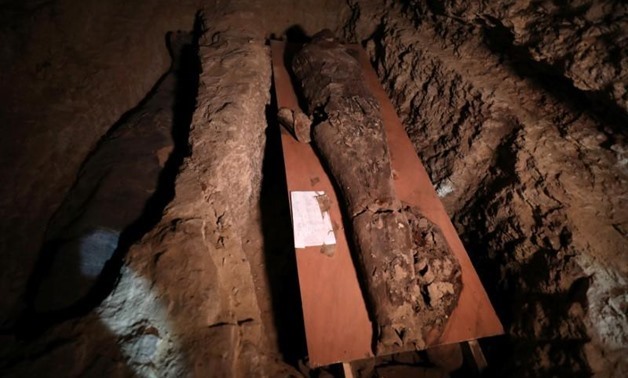 Director of Aswan and Nubian Antiquities, Abdel-Moneim Saeed, believes that the tomb may have been used as a communal burial site due to the large number of mummies buried there haphazardly." NS: A large surprise awaited excavators near the open-air Mit Rahina Museum: a large building with corridors and entrances as well as a bath from Roman times that was attached to its south-western side. "An Egyptian archaeological mission has uncovered a huge edifice with several corridors and four entrances during excavation work carried out in Hod El-Demerdash, 400 metres to the south of Mit Rahina Museum in Giza. Mostafa Waziri, the secretary-general of the Supreme Council of Antiquities, says that the building is 16×14.5 metres and was likely once part of a residential site in the area. The structure is built of mud brick supported by large blocks of limestone, and its outer walls and inner staircases are built in red brick." NS: Egypt's Ministry of Antiquities announced another round of discoveries at Kom Ombo in early October made as part of the aforementioned work in reducing groundwater levels. Two very large stelae with heights of 2+ metres preserve large figures of divine and royal persons with inscriptions identifying these as belonging to Sety I and Ptolemy IV – they ruled over 1,000 years apart! "The Ministry of Antiquities announced the discovery of two sandstone stelae in the Temple of Kom Ombo in Aswan. The discovery was made on Sunday by Egyptian archeological expedition. The latter was working on the groundwater reduction project at the Kom Ombo temple in Aswan when it discovered two sandstone stelae that belonged to King Seti I and King Ptolemy IV. It was found divided into two parts, but the hieroglyphic inscriptions were preserved in good condition." NS: This discovery made a big splash when it was first announced: a tomb belonging to the official Kaires from the Fifth Dynasty. He had his tomb chapel paved with blocks of basalt showcasing his important status. A large granite statue of the deceased awaited excavators in his burial chamber, proving perhaps that statues were indeed placed within burial chambers during the Old Kingdom! "A team of Czech archaeologists have made a remarkable discovery at Abusir, near Cairo, unearthing a unique burial complex of an Egyptian dignitary dating back to the fifth Dynasty of the Egyptian Old Kingdom. The limestone tomb is located in the centre of a pyramid field where only members of the royal family and the highest state dignitaries of the time were buried. Among the items discovered in the burial chamber of priest Kaires are parts of the decoration of the chapel, depicting scenes from everyday life, as well as ceramic objects which were included in the burial equipment. But perhaps the most important find is a granite statue depicting Kaires sitting on a small chair. According to Czech archaeologists, it proves that ancient Egyptians placed statues into their burial chambers, a question they have been trying to answer for years." NS: Exciting news from Kom Ombo made the rounds once more: a major stela showing the important figures of Queen Tetisheri and Queen Ahmose-Nefertari. The stela provides important evidence of Theban activity in the area as the Thebans were in the process of campaigning against the northern Hyksos.